Venue: Hindu temple of Central Florida. 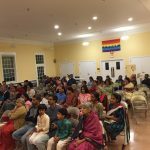 The Hindu Temple of Central Florida hosted a Bhagavata Saptaham. The 7 day event took place in a grand manner. Sri Ramanujamji explained the charitra of Druva, Prahlada, Ambarisha etc with great enthusiasm. He stressed on the importance of Namakirtan in Kali yuga and said that Ajamila Charita is a proof for this. He also explained Krishna leela in detail highlighting the fact that Krishan showers his grace on all who does Namakirtan. 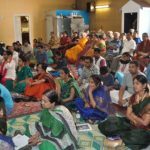 Approximately, 100 devotees participated each day and needless to mention that the whole event was enjoyed by one and all. Mahaprasad was served at the end of the program for each day. Sri Ramanujamji mentioned that prayers are very powerful. More powerful are prayers when they are performed in a group. 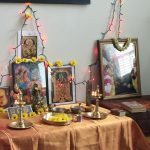 The 7th day of the saptaham ended with Rukmini Kalyanam. Following this there was a mass prayer.The devotees had the prayers in their mind and Mahamantra was chanted by each one of the 120 who participated that day. The devotees partook the Mahaprasad and departed carrying Mahamantra in their hearts. Earlier, there was a two day program on 8 and 9 Jan 2010 at 6:30pm at Visconti Club House, Maitland,FL. On the first day Sri Ramanujamji extoled the greatness of Srimad Bhagavatam and how ‘Krishna Priyam’ or love for Lord Krishna will be developed in the hearts of listeners and readers of Srimad Bhagavatam. 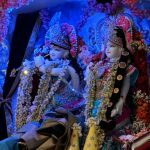 On the second day, Sri Ramanujamji explained the story of Ajamila verse by verse to drive home the fact that Namakirtan is the only easiest path to liberation in the age of Kali Yuga. 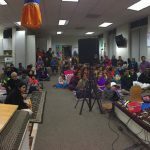 The 40 devotees thoroughly enjoyed both the days.